Installed on new and used vehicles, 3M Paint Protection Film, also known as “clear bra,” is a nearly invisible film that is applied to the painted surfaces of your car (hood, fender, bumper, mirrors, etc.) to protect them from road debris such as rocks, bugs, salt, etc. Made of a 6 mil (.006”) thick clear urethane plastic (8 mil when you count the adhesive), 3M Paint Protection Film was initially designed to protect helicopter blades from debris during the Vietnam War. Since then, it has been used by various auto manufacturers and NASCAR teams to protect painted surfaces from rock chips. Maintain the appearance of your vehicle and enhance its trade-in value by protecting its paint with 3M Paint Protection Film. 3M Scotchgard™ Pro Series Clear represents the latest technology in paint protection film. The unique technology that separates this product from its competitors is a true testimony to 3M’s innovation. Industry-leading clarity (less orange peel) and self-healing and stain-resistant characteristics, Scotchgard Pro Series is designed to give you years of protection and performance without ongoing maintenance. Unlike your car’s paint, when 3M Pro Series is scratched, the scratches virtually disappear, keeping your film looking newer longer. It is warrantied for labor and material by 3M Company for ten (10) years. 3M offers an optional warranty that if the film fails and the paint is compromised 3M will pay up to $3,500.00 to repair the damage. Virtually nothing can protect your vehicle better from scratches, stains, and chips than 3M Paint Protection Film Pro Series. It’s truly the ultimate protection for paint. 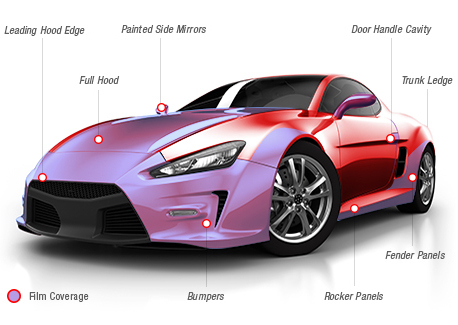 3M Scotchgard™ Pro Series Matte delivers superior personalization and protection to automotive paint. Matte series is based off of the same technology as our clear film yet has a satin finish that matches the sheen of most factory matte paints. It can also be used to remove the gloss from your vehicle’s traditional paint and give a matte appearance. Like Pro Series Clear, Matte Series is warrantied for labor and material by 3M Company for ten (10) years. 3M offers an optional warranty that if the film fails and the paint is compromised 3M will pay up to $3,500.00 to repair the damage.